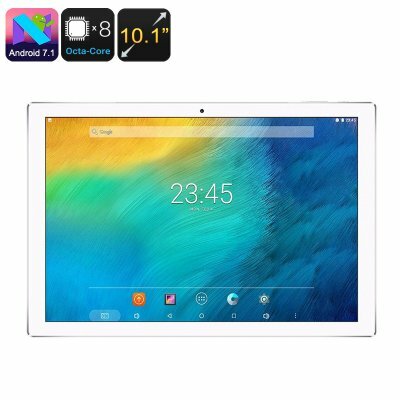 Successfully Added Teclast P10 Tablet PC - Android 7.1, Octa Core, 2GB RAM, 32GB Internal Memory, 10.1 Inch Display, OTG, 6000mAh Battery to your Shopping Cart. The Octa Core processor offers high performance making multitasking possible. The Teclast P10 Tablet PC is powered by Android 7.1 that enables you to have access to the latest games and apps. This tablet was designed for providing the exemplary user experience. The tablet PC has a metal body that gives a unique and sophisticated look and feel. It is lightweight so you can easily take with you anywhere. The P10 Tablet PC features a strong and powerful Octa Core processor that offers a great gaming experience with smooth audio, excellent video playback, and FHD graphics. You can play heavy games without any lag that will deliver a great gaming experience. The processor will offer maximum efficiency to ensure exemplary user experience while making multitasking easy. It has 10.1 inches display screen with 1200 x 1920 HD screen. You can enjoy various movies and TV series on a bigger screen with amazing visuals. The color reproduction is excellent and it has different viewing angles. The great pixel resolution provides you clear and crisp images. The Tablet PC boasts 6000 mAh battery size that can last for 4 hours on a continuous use. The charge time is 3 hours and the standby time is 48 hours. This is a perfect partner for a long journey that enables you to enjoy games and media for a long period. The Teclast P10 tablet features a 5-megapixel rear camera with the 2-megapixel front camera. This lets you snap photos and use video chat apps such as Skype. You can capture precious moments without any trouble the great camera of the tablet lets you take bright, clear and sharp photos. This Tablet PC has 32 GB internal storage that can be extended to 64 GB using microSD card. Moreover, you can store plenty of files on the tablet without worrying about running out of space. The Teclast P10 product comes with a 12 months warranty. Brought to you by the leader in electronic devices as well as wholesale Android tablet computers..